PROBLEM: Neighborhood playgrounds are underutilized. All in all, the playgrounds that our challengers visited were surprisingly empty. According to one challenger’s notes, 60 percent of the playgrounds she visited had less than five other people present. Many remarked that the smaller neighborhood playgrounds tended to be more sparsely utilized, while larger, “fancier” playgrounds attracted more crowds. SOLUTION: Building a playground also requires building a community. If you build it, will they come? Not necessarily. The community-led playground building model that we practice at KaBOOM! is designed to encourage the surrounding community to take ownership of the playground—not only to help design and build it, but also to look after it and, most importantly, to play on it! Where is everyone?! Woodlawn Memorial Park in Woodlawn, Md. Photo by Sherry Frick. PROBLEM: A lot of playgrounds look the same. Our challengers found that there was surprisingly little variation in the types of equipment they found from playground to playground. Their children were immediately drawn to playgrounds with a novelty factor. Across the board, kids particularly enjoyed the few wooden playgrounds they visited, mostly because they represented something new and special. SOLUTION: All playgrounds need a little something to set them apart. It doesn’t have to be extravagant or expensive. While we applaud the efforts of cities, like New York, that are actively investing in innovative play equipment, we also recognize that not every neighborhood has millions of dollars to throw around. A tight budget doesn’t have to preclude creativity. 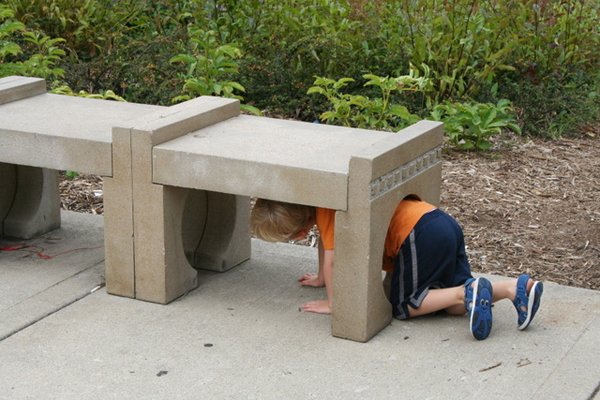 For instance, in the playground pictured below, a simple bench doubles as a tunnel. A bench or a tunnel? Innovation doesn't have to be extravagant. Ping Tom Memorial Park in Chicago, Ill. Photo by Liza Sullivan. PROBLEM: Playgrounds are a tough sell in the heat. Our challengers surmised that the soaring temperatures probably had something to do with the sparse attendance at neighborhood playgrounds. Equipment left baking in the sun is not only unappealing, it can be dangerous, sometimes measuring more than 150 degrees. Some of our challengers were up and about just after sunrise in an attempt to beat the heat. SOLUTION: Two words: shade and water. Summer is when kids have the most time to play, and it’s a shame to see playgrounds go unused because it’s just too darn hot. Trees and shade structures are a great way to ensure that an existing playground remains usable when the temperatures start to rise. Some playgrounds, like the one pictured below, have also found innovative ways to incorporate water into their playscapes. This innovative "mister" keeps kids cool during the hot summer months. Photo by Tracey Quinn. 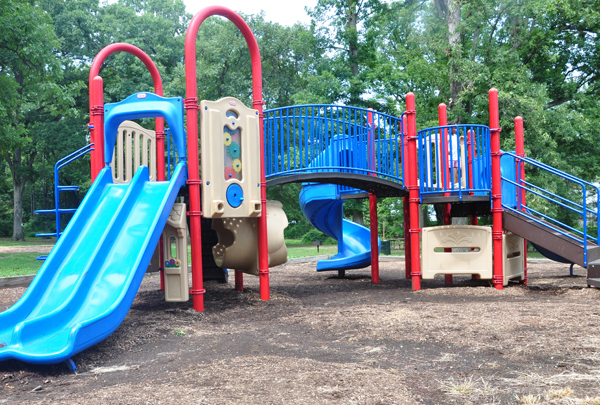 To help build community around your playground, you can “adopt” it in our Playspace Finder. Organize improvement projects, start play groups, and provide photos and reviews for other area parents. To set your playground apart, browse some of our enhancement project ideas for inexpensive, playful touches you can add to an existing play area. To keep your playgorund cool, watch our “All About Trees” webinar for information on incorporating trees into your playground. The American Academy of Dermatology offers $8,000 grants for shade structures.